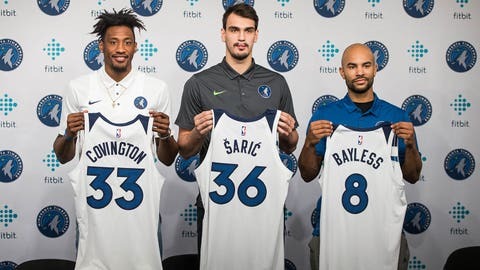 After a few months of trade speculation, the Minnesota Timberwolves pulled the trigger last week, sending Jimmy Butler and 2017 first-round pick Justin Patton to Philadelphia in exchange for three players: Robert Covington, Dario Saric and Jerryd Bayless. Who are these players, and what do they bring to Minnesota? Contract: Signed a four-year, $62 million extension with Philadelphia in 2017. Career path: Undrafted out of Tennessee State; signed as free agent with Houston in 2013. … Named D League Rookie of the Year in 2014. … Signed with Philadelphia in 2014 and played four full seasons with the Sixers before being traded to Minnesota. Skinny: A strong defender and a capable 3-point shooter, Covington started 80 games for the 76ers last season, averaging 12.6 points 5.4 rebounds and 2.0 assists per game. A career 35.9 percent shooter from deep, Covington is known to be streaky (for better or worse) and averaged a career-high 39 percent from downtown last season. He was recognized for tenacity on defense in 2018, named to the NBA All-Defensive First Team after setting a new career best with 1.8 blocks and 1.8 steals per game. RoCo made his postseason debut with the Sixers last year and started eight games, logging averages of 8.1 points, 5.3 rebounds, 2.5 assists and 1.1 steals per contest. Fun fact: Covington had just two scholarship offers out of high school — Tennessee State and Sacramento State. Contract: Signed a four-year deal worth $10.7 million in 2016 and will become a restricted free agent in 2020. Career path: Selected 12th overall by Orlando in 2014 but was traded to Philadelphia on draft night in exchange for Elfrid Payton. … Signed a three-year deal with Anadolu Efes of the Turkish League in 2014 and didn’t make his NBA debut until Oct. 26, 2016. … Played 172 games from 2016-18 for the Sixers before being traded to Minnesota. Skinny: Saric flashed some major potential during the second half of his rookie season. He emerged as a full-time starter towards the end of February in 2017, averaging 17.3 points and 30.4 minutes in 25 games down the stretch and finished second in the Rookie of the Year voting. Although he’s off to a slow start this year, the third-year Croatian shot 39.3 percent from deep a season ago while averaging 14.6 points, 6.7 rebounds and 2.6 assists in 73 starts. And Saric stepped up in the playoffs, averaging 17.2 points, 7.3 rebounds and 3.5 assists in 10 games against Miami and Boston, including 25- and 27-point performances in Game 4 and Game 5. Fun fact: “The Homie” turned pro at age 15 and drew comparisons to Drazen Petrovic, a legend who starred for Yugoslavia in the 1980s and ‘90s and has a plaque in the Naismith Memorial Basketball Hall of Fame. Tale of the tape: Saric has a nice shot and can splash from 3, but he’s also got a few dance moves up his sleeves — and isn’t afraid to break them out during free throws. Contract: Will be an unrestricted free agent after the 2018-19 season. Career path: Selected 11th overall by Indiana in 2008. … Minnesota is his eighth franchise in a 10-year career, joining Boston, Memphis, Milwaukee, New Orleans, Philadelphia, Portland and Toronto. Skinny: Bayless hasn’t played this season as he recovers from a knee injury. Now in his 11th year out of Arizona, Bayless is a respectable shooter – 41.1 percent from 3-point range the last three seasons — and could probably contribute off the bench at some point. Fun fact: As of 2014, he’d already made two hole-in-ones on the golf course. Who knows what that total is now? Tale of the tape: One of Bayless’ signature shots was a game winner for Milwaukee in the 2015 Eastern Conference quarterfinals that forced a Game 5 against the Bulls.